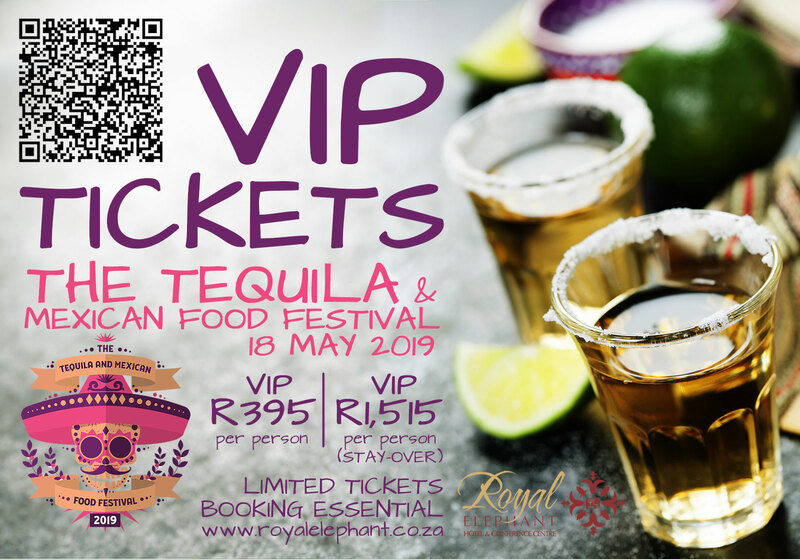 On the 18th of May 2019, the annual Tequila & Mexican Food Festival will once again be hosted on the Lawns at the Royal Elephant Hotel and Conference Centre, and this time we want to fill out the space to the max! The organisers have secured headline acts like Jeremy Loops and Jo Black so you know its going to be another quality event, and due to popular demand, The Royal Elephant Hotel will once again be hosting a VIP Section. This is the platinum experience! Extremely limited space – Booking Essential! These are the tickets you want! Limited space – Booking Essential! Maybe you need tickets for family traveling with you but that just want access to the festival? These are the tickets you want. Our price matches the tickets from the organisers. Please provide a contact number - should anything happen to the email, we can still get hold of you! These are the tickets you want! Please note that the price is R395 per person sharing and includes entry, a VIP PACKAGE and entry to the VIP area, but NO accommodation. How Many VIP STAY-OVER Tickets?